Packaging Design outlines a journey that will steer your students toward authentic problem solving while grounding them in integrated STEM disciplines. As are the other volumes in the STEM Road Map Curriculum Series, this book is designed to meet the growing need to infuse real-world learning into K–12 classrooms. •	Explore how marketing, packaging, and communications connect. Students will examine how to repurpose a product, or market it to new customers, through innovative containers such as nested packages (or packages within packages). •	Build persuasive writing and speaking skills. Using PowerPoint presentations and social media campaigns, students must convince a client that their repackaged product is marketable and then convince customers to buy it. •	Develop content knowledge. For example, as students think about nested packages, they learn about geometric properties of three-dimensional shapes and engineering design. •	Consider the complexities of marketing, from grappling with sustainability issues to meeting customer needs while making a profit. Activities include designing a package that keeps tortilla chips from breaking and transforming an old product with new packaging and marketing techniques. The STEM Road Map Curriculum Series is anchored in the Next Generation Science Standards, the Common Core State Standards, and the Framework for 21st Century Learning. 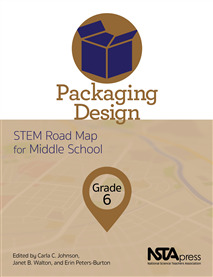 In-depth and flexible, Packaging Design can be used as a whole unit or in part to meet the needs of districts, schools, and teachers who are charting a course toward an integrated STEM approach.